The brief to the architect was for a home that made the most of the site and catered for the needs of the family now and into the future. With succession planning for the farm in mind, it was important to make sure the home would be suitable for the generations to come. “We had to plan for a house that would be lived in as a base for the farm for 50-100 years providing a home for growing families, not just think about what we needed,” says the owner. It was important to the owners, who have lived and farmed on the land for 18 years, to work with people they knew and support businesses in their community. The architect was a family member, based in Dunedin and the builder, managing director of Lone Pine Building Andrew Bell, a family friend with rugby club connections. Andrew and the Lone Pine team jumped at the chance to get involved in such a unique and challenging build project and are thrilled with the stunning results. The icing on the cake was taking out the title of Supreme New Build in the Registered Master Builders House of the Year for their region. The large home comprises two expansive living areas, four bedrooms, three bathrooms, large laundry, gym, a snug and a mud room to discard the dirty boots and work gear before coming inside. The living areas and all of the bedrooms open out towards the view with the dining room adjoining a spacious deck and entertaining area with an outdoor fire constructed of West Coast schist. This same stone has been used to great effect to construct the fire surrounds in the lounge and the snug. Andrew from Lone Pine worked closely alongside the motivated owners to manage the build which took 18 months to complete. Assembling a team of sub-contractors whom he knew would take as much care in the quality of the build as he did, he says it was a huge team effort to deliver on the owner’s vision. 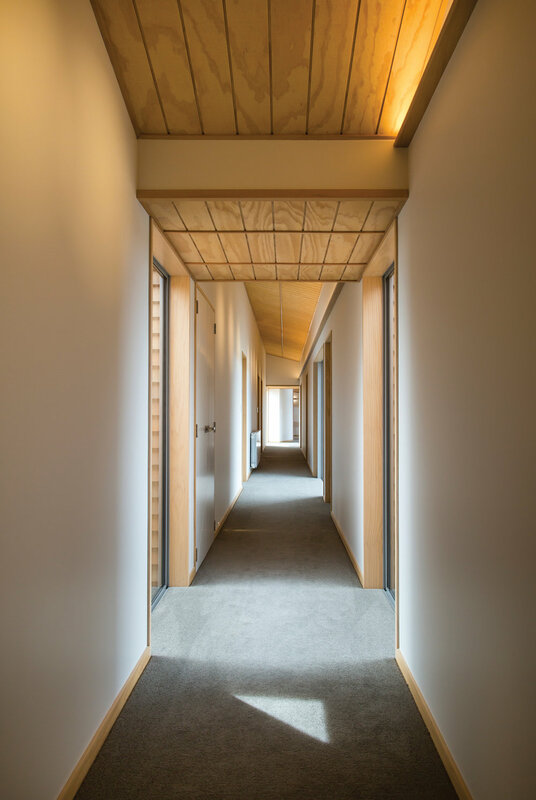 “There were lots of challenging elements to this job, with the internal timber you just had to get it right because you only got one shot at it. It was great to work on a project that presented a challenge and something different from the homes you normally see.” Andrew points out the attention to detail in the design that he believes makes this home special. In the bedrooms the addition of blue stone pavers between the edge of the carpet and the sliding external doors provides a buffer when coming in with dirty feet, and they also warm up during the day in the sun and then release the heat overnight. The complex nature of this particular award-winning design meant the building process took time. The owners continued to live in the old villa that has now been relegated to the role of site office for their farming business. “It was a long process but working with Andrew and his team was great, he’s an exceptional builder and we love the results.” When asked what their favourite things are about the house they say, “We love how warm it is!” With underfloor heating throughout, along with radiators as a back-up, it’s a welcome contrast to the original draughty farmhouse. Other than that, it’s the creative and stunning use of the wood and the cosy snug – a favourite room – that they are most pleased with. 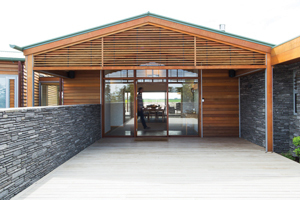 The owners were passionate about using timber throughout their home and engaged JE Dennison Joinery from Timaru to deliver on the visually stunning but technically complex design. Dennison crafted the kitchen cabinetry, bathroom and laundry vanities, wardrobes, bookcases, doors, cavity sliders and suspended lighting boxes as well as many of the other timber details throughout. “Ensuring that communication was open was key to this build, it demanded a lot of discussion between the clients, builders and architect,” says Brad Dennison. 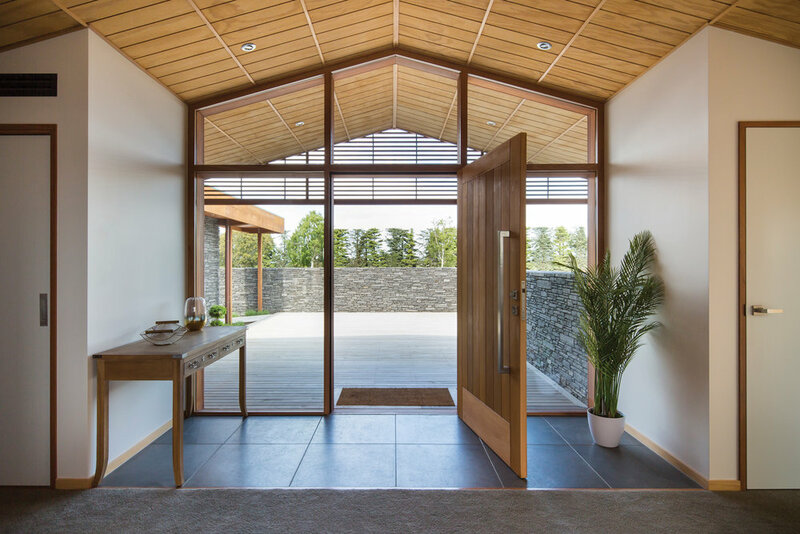 “The timber needed to present its personality yet respect the modern and contemporary lines, features and finishes.” With the ceilings constructed of untreated band-sawn pine, the home also features door frames in saligna, internal and external doors constructed of western red cedar and ceiling beading, lighting rails and hanging boxes of kauri. Brad says that working on the owners’ ambitious and creative vision for a home that showcased timber and craftmanship was a joiner/craftsman’s dream. “Seeing the combination of all the timbers in one place was incredible and the end result was just beautiful. The project is a testimony to everyone involved,” he says. With the build complete and the home in the running for the House of the Year, the builder and owners wanted to add those touches that would take the property from house to home. They recruited Maree from Maree Hynes Interiors to source and supply unique furnishings, bedding and homewares. Andrew and the large team of sub-contractors threw everything at bringing their client’s plan and dreams for the future into reality. Of the build process Andrew says, “We are so grateful to everyone involved, our clients and the sub-contractors for the amount of effort and passion they put into the project.” At times the team were presented with big challenges and had to nut out just the right way to tackle tricky problems, and this was part of what made the project so rewarding. This plus the knowledge that the home will live on as the family homestead, built to last and be enjoyed for many decades to come, has made it a special journey for all involved.